First World War: Myth or Misbegotten Shambles? The Royal Mint’s own description of its controversial new coin to mark the anniversary year of the outbreak of the First World War. Since Jeremy Paxman began expressing his concerns about the Prime Minister’s plans for commemorations comparable to the Diamond Jubilee, a political argument has intensified over the tone and purpose of events. 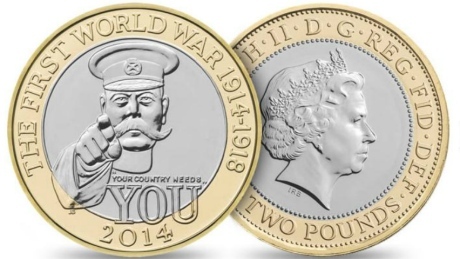 Does the choice of Kitchener, rather than, say Edith Cavell, for the £2 coin count as “nostalgia”? Or, as the Royal Mint says, a legitimate visual symbol of the war which the Mint’s committee agreed most people would recognise? All these rows were anticipated a few months ago. Original Oh What A Lovely War! 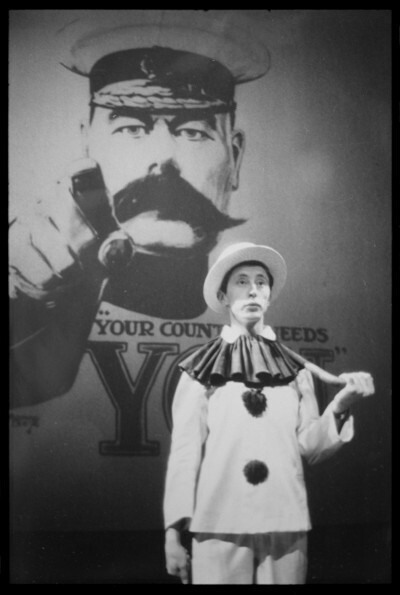 cast member, Murray Melvin described the pressure from the political and military establishment on the show back in 1963 in a special programme we recorded in October about the creation of the production, on stage at the Theatre Royal, Stratford East. Dialogue was carefully sourced from actual quotes of generals and politicians, the new historical books such as Alan Clark’s 1961 revisionist The Donkeys, and controversial arguments were presented in the show about the vested interests of transatlantic munitions magnates and the fortunes which were made supplying weaponry to all sides. (Interestingly this last aspect was dropped entirely from the Hollywood film version directed by Richard Attenborough). But Melvin recalls the tension back stage as they saw General Haig’s family lawyers in the audience looking for any aberrations from the script to justify legal action. Together with historian David Kynaston, theatre critic Michael Billington and RSC deputy artistic director Erica Whyman, the programme places the show in context, not only of its relationship to WW1 in 1963, but its legacy today, as a new production prepares to open. This entry was posted in Culture, History, Media, Politics, Radio, Theatre, Uncategorized, War and tagged Edith Cavell, Field Marshall Haig, General Kitchener, Jeremy Paxman, Michael Gove, Murray Melvin, Night Waves, Oh What A Lovely War!, Royal Mint, Theatre Royal S, Theatre Workshop. Bookmark the permalink.